Tokyo and New Delhi may complete four-year-long negotiations on the sale of Japan’s US-2 surveillance aircraft to India. 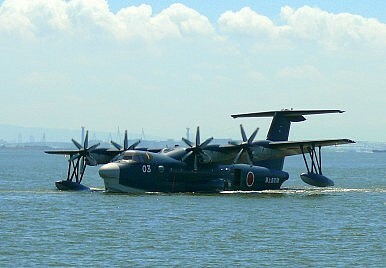 I’ve been writing on Japan-India relations for years and it seems like a highly anticipated deal for the sale of Japanese-made Shinmaywa US-2 amphibious aircraft has been just around the corner since at least 2011. Now, the Japan Times reports that the two countries are likely to at long last reach “a broad defense accord” when Shinzo Abe visits New Delhi from December 11 to 13. New Delhi and Tokyo, under their strategic global partnership, hold annual prime ministerial summits (each affords this privilege to no other country). The deal, once completed, would signal a major step forward in India-Japan security ties, building on parallel developments including Japan’s bid to join the U.S.-India Malabar naval exercises as a permanent member. Negotiations for a US-2 sale to India began in Japan under the Democratic Party of Japan (DPJ) governments of Naoto Kan and Yoshihiko Noda. The amphibious aircraft sale issue was swiftly picked up by Abe’s government, which has sought to expand Japan’s role as a defense exporter in Asia. In April 2014, the Abe administration formally altered Japan’s decades-old self-imposed ban on selling arms, which effectively blocked Japanese firms from participating in global defense commerce. (For more background on Japan’s export policies, see here.) Meanwhile, Japan and India, though close strategic partners whose ties have only grown since Shinzo Abe and Narendra Modi rose to the helm of the bilateral, have no formal government-to-government channels to negotiate arms sales. The Shinmaywa US-2, the kit at the center of this now four-year-long negotiation process, is a relatively unexciting piece of kit. It’s a reliable and capable surveillance aircraft. For India, the primary attractive feature of the US-2 is its versatility and its usefulness in maritime search and rescue operations due to its short take-off ability. The Indian Navy will likely deploy the aircraft to support military and civilian ships in the Indian Ocean and even deep in Southeast Asian waters, according to one Indian military source. With a range of 4,500 kilometers, the US-2 should reinforce India’s sea patrol and maritime domain awareness capabilities considerably in the Arabian Sea and Bay of Bengal. Progress on this deal will be a deliverable to watch for when Modi and Abe meet in a couple weeks. Though the US-2 sale has long been politically uncontroversial in both Tokyo and New Delhi, the devil with this deal is in the details. Tokyo is concerned about the possible leak of Japanese technological secrets. The Indian Navy is looking to license US-2s for assembly in India. Finally, depending on the outcome of negotiations on cost, India could expand its order from 12 units to as many as 18. New Delhi and Tokyo reportedly have agreed on a price for 12 amphibious search-and-rescue aircraft. Is the Japan-India Military Aircraft Deal Dead? India and Japan Inch Closer to Surveillance Aircraft DealAre India and Japan About to Conclude a $1.3 Billion Military Aircraft Deal?India-Japan Military Aircraft Deal Faces Further DelaysAs Modi Gears Up to See Abe Again, What's Holding Back India-Japan Ties?